Manchester United will play away at Swansea City in the fourth round of the Carabao Cup, while Chelsea will be at home against Everton. Manchester City have been drawn against Championship Wolves, with Tottenham hosting West Ham in a London derby. Arsenal play Norwich City, while Leicester City, who knocked out Liverpool, face Leeds United at home. Bournemouth host Middlesbrough and Bristol City take on Crystal Palace in the other fourth-round ties. 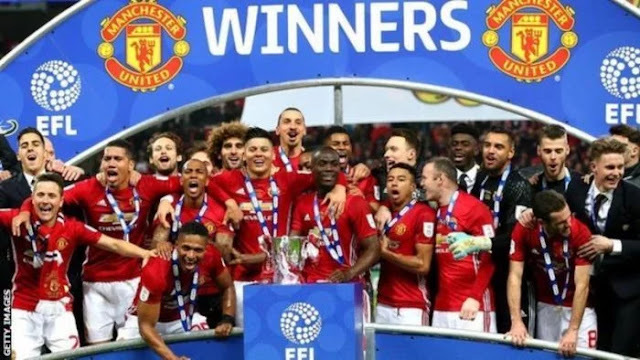 Jose Mourinho’s United, who beat Southampton in the Wembley final in February, moved into the last 16 with a comfortable 4-1 win over Championship side Burton Albion and meet 2013 League Cup winners Swansea. Chelsea beat Everton 2-0 in the Premier League in August and the two sides will meet at Stamford Bridge after comfortable third-round wins over Nottingham Forest and Sunderland respectively. Norwich, 12th in the Championship, are the lowest ranked side left in the competition and travel to Emirates Stadium to play Arsenal, who edged out League One Doncaster Rovers. Championship Bristol City have knocked out Premier League teams Watford and Stoke City and entertain Roy Hodgson’s Crystal Palace in round four. Manchester City beat West Brom 2-1 on Wednesday and will next play a Wolves side who are second in the Championship. City needed a replay to get past then-Championship side Huddersfield in the fifth round of the FA Cup last season and boss Pep Guardiola said he will not under-estimate the second-tier side. “We will respect Wolves and we know from experience against Huddersfield last season so we will be ready,” said Guardiola.